Matcha tea is something that I simply can't get enough of. I tried my first matcha latte about three years ago & I've been hooked ever since. 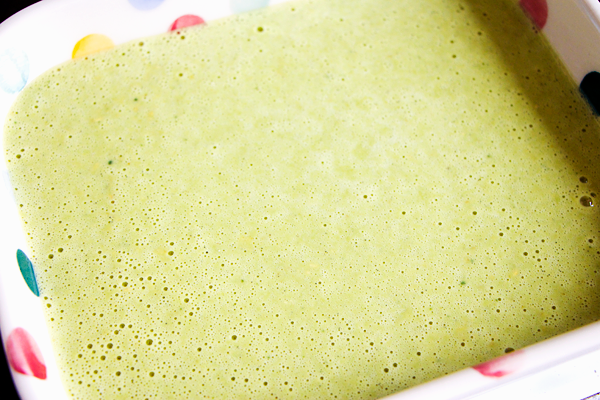 Matcha is basically a powdered version of green tea leaves. 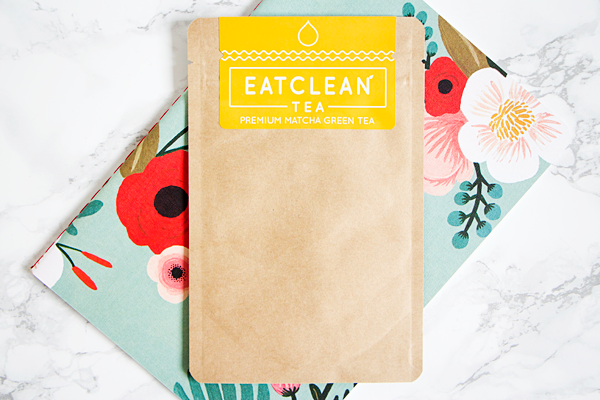 It has 137 times the antioxidants of regular green tea & a much smoother flavour. It can also be used in food, not just drinks. So far I've tried matcha oreos, pocky, ice cream, kit kats & swiss roll. The oreos were my favourite, I just picked them up from my local Chinese supermarket. Anyway I've been keen to try out some more baking recipes using matcha instead of just drinking it every morning. 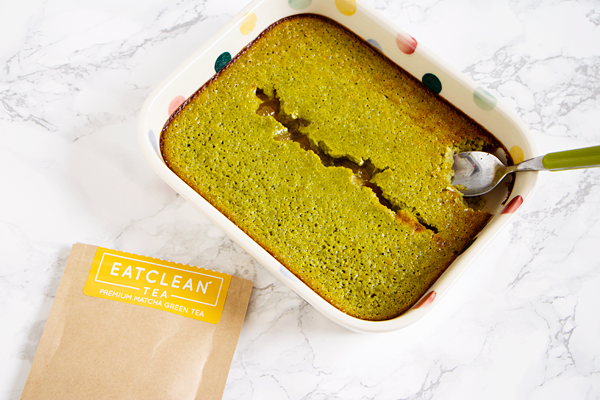 EatCleanTea are currently running a #SummerOfMatcha competition & asked me to come up with a recipe using one of their matcha powders. 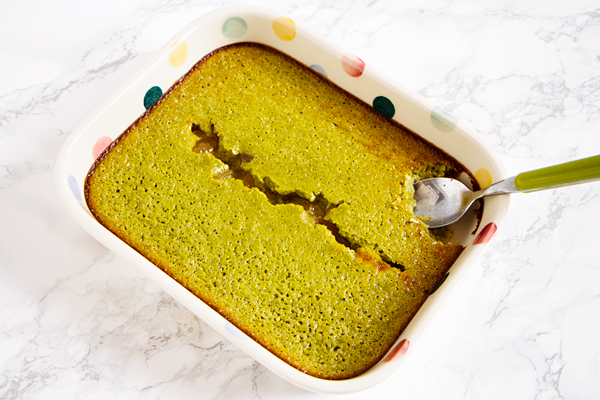 I'm still following the Slimming World diet so I decided to make something SW-friendly in the form of these delicious matcha & ginger baked oats. 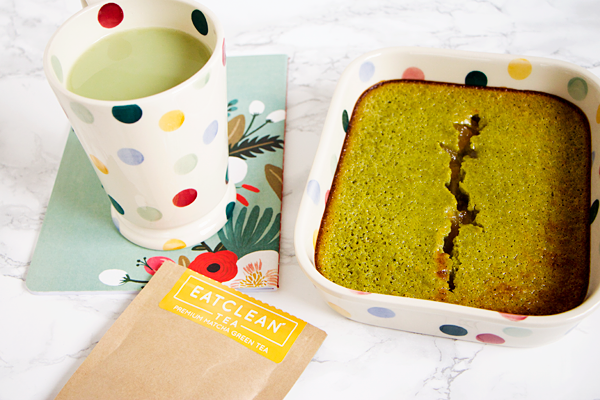 EatCleanTea use the highest quality green tea leaves from Japan to make their matcha powders. Something I've never come across before is flavoured matcha so I was eager to try one of theirs out. I chose the Matcha & Ginger tea. They also do plain & mint matcha. The ginger variety tastes incredible & features many health benefits. 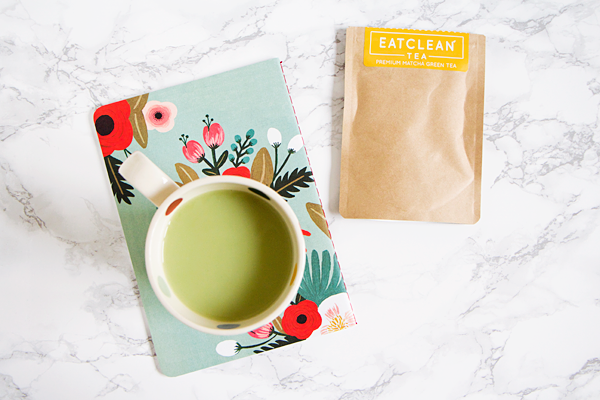 The matcha increases your energy levels, boosts your metabolism & detoxifies your body. The ginger boosts your immune system, lowers your blood sugar & helps to relieve muscle soreness. It's also great if you suffer from frequent indigestion or nausea. This tea has the same mellow flavour of plain matcha but with a sweet & spicy kick from the ginger. It smells really strong & tastes a bit like fresh gingerbread. 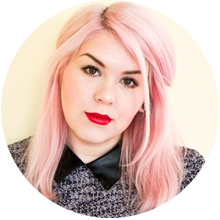 I normally eat a bowl of porridge every day for breakfast as it's the only thing that actually fills me up & it fits into the Slimming World plan. 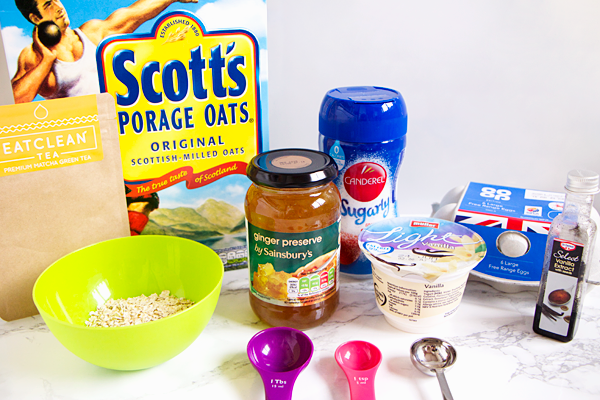 35g of oats counts as one healthy extra B. My consultant recently posted a recipe for baked oats on our Facebook group & it tasted just like cake! Everyone in my group is totally addicted to eating them. They make a nice change to having porridge every morning but are just as filling & even more scrumptious. 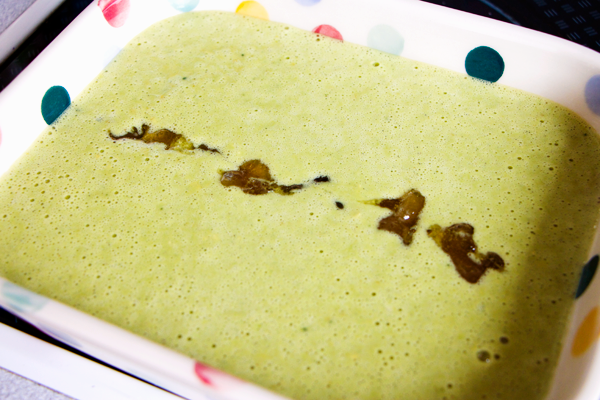 As I have already tried mixing matcha into my porridge, I knew that the flavours would go well together. I figured that I could put my own spin on the recipe by using the tea to create matcha & ginger baked oats. Put all the ingredients except the ginger preserve in a bowl & whisk together. Pour the mixture into a small oven-proof dish. Drizzle the ginger preserve down the middle of the mixture in the dish. Bake at 180°C/350°F for 25-30 minutes. I'm really pleased with how the baked oats came out. They don't taste oaty or like a flapjack at all. The texture is like a very dense cake which is always fun to eat at breakfast time. 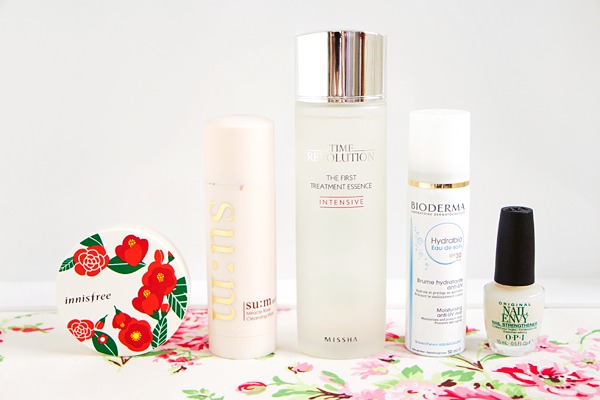 It feels very indulgent yet is still completely on plan. 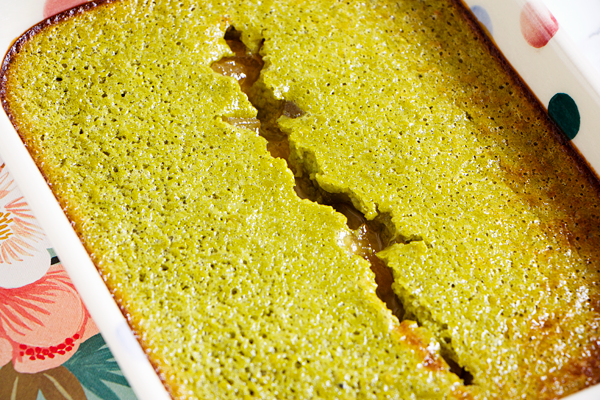 The ginger matcha & ginger perserve both add a really fiery kick to the dish. This amount of matcha powder is sure to get you buzzing all day long. Let me know if you try it out!